Dr. Cara Miller has a very persistent alarm clock. It doesn’t have a snooze setting, and it often comes with a couple of whiskery kisses. Cara’s alarm clock is named Turf, and he’s a black Labrador and an expertly-trained hearing dog from Canine Companions for Independence. 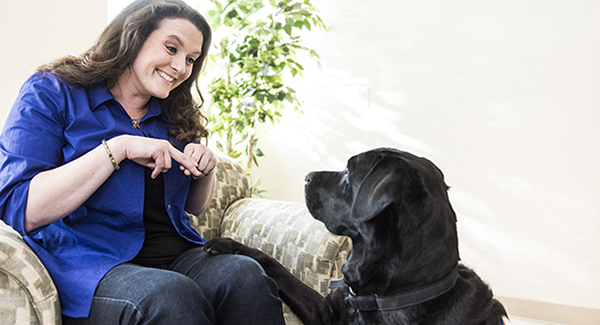 Cara is a Professor of Psychology at Gallaudet University, the premier institution of learning, teaching and research for deaf and hard-of-hearing students. From her home to the busy campus grounds and commute through Washington, D.C., Turf has an important job — he is tasked with being Cara’s ears. October is Disability Employment Awareness Month. Click here to see how Turf supports Cara with her career everyday. Share the mission of Canine Companions® and celebrate the season with these holiday note cards. With a donation of $15, you will receive a package of 12 high-quality note cards and envelopes. Order soon, supplies are limited. With the increase in veterans returning with PTSD, we have launched a pilot program to directly place service dogs with these veterans. We celebrated the first graduating class last week. Watch the graduation here. Meet Canine Companions puppy Buckeye! NBC4 in Columbus, Ohio is following Buckeye on his journey toward becoming an assistance dog. Read about Buckeye's on-screen activity and what he's learning along the way. You can almost smell the puppy breath. Buy your 2019 puppy calendar today! Honor a deserving person in your life. Make a tribute gift and send an ecard. Order Mutt Lynch Winery's Canine Companions puppy label wine and 25% will be donated back to us! Support Canine Companions through your CFC giving campaign. Become a volunteer puppy raiser and feel the joy. Your old car can help change someone's life. Donate your car to Canine Companions. Don't miss a thing. Follow @caninecompanions on Facebook.